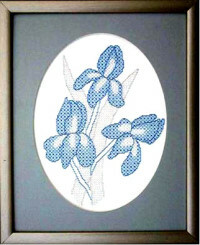 Blackwork flower patterns have been popular almost as long as the technique itself, whether representing flowers in a border or band, or as an actual floral study, such as those featured here. The simplest of these designs is the bellpull at the bottom of the page. The others use shading techniques. 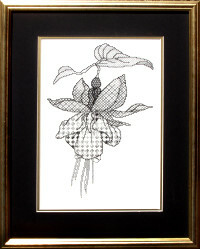 which you can try out with my free pansy pattern or grab yourself a copy of my blackwork ebook. The measurements given, are for 14 count fabric. 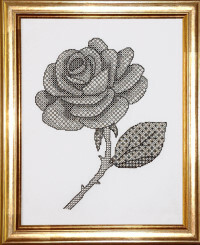 Worked in traditional black and gold, the rose uses variations on each fill pattern to give a life-like shaded effect. 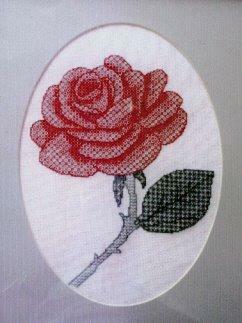 Enid stitched her rose in traditional red and green embroidery floss colors. What a beautiful job she did of it too! This fuchsia is charted in 3 different thicknesses of black thread with gold beads to accent. Shown left, is the version that M E Cattrall, from Lancashire, UK, stitched using randomly dyed thread for the flower and plain DMC floss for the leaf. Didn't she do a lovely job? This design is beautifully shaded in grays and black, with gold accents. 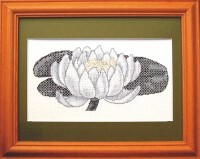 Suitable for stitchers with experience in working blackwork. Simple to stitch with a tiny bit of shading. Charted in purple/green or blue colourways. 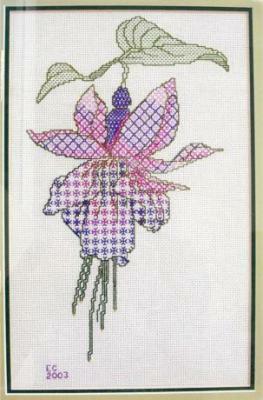 Designed as a tribute to Queen Elizabeth, the Queen Mother, this sampler is simple to stitch. It uses red and dark green threads, and two variations on each fill pattern for the leaves, to give a light and dark side. You will learn a large variety of fill patterns by completing this beautiful design.